Lucky Strike J.M. Talley Ad 1941 This is September 30, 1941 advertisement It is a nice color ad from The American Tobacco Co., makers of Lucky Strike cigarettes. It pictures J M Talley as he inspects a leaf of fine, light tobacco, before aging. 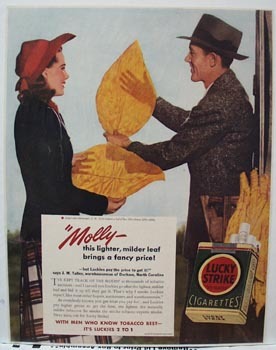 He is saying to a lady visitor, Molly, this lighter, milder leaf brings a fancy price. In mint condition. Photo is taken through plastic and may show wrinkles or crookedness that is not in the ad. This magazine tear sheet measures 9 1/2"" wide by 12 1/2"" tall. Items Similar To "Lucky Strike J.M. Talley Ad 1941"